The 5th annual Undergraduate Research Symposium (URS) was held on October 13, 2017 on the SDSU campus. The Maximizing Access to Research Careers (MARC) program in partnership with the Initiative for Maximizing Student Development (IMSD) initiated the URS years ago in an effort to provide scholars with a platform to practice and develop their presentation skills before presenting their research to larger audiences at local and national conferences. Our efforts to prepare our scholars to deliver strong, cohesive, and organized presentations are always bolstered by their mentors and the graduate students who work tirelessly alongside them, sometimes for weeks in advance, to solidify their presentations. There were 25 students who had an opportunity to share the exciting and diverse research that they have been working on in their SDSU lab or their summer research projects to more than 60 symposium attendees: peers, faculty and guest from the College of Sciences and Engineering were all in attendance. We are grateful to the facilitators and judges (SDSU faculty and staff, IRACDA fellows, and MARC and IMSD alumni) in the different discipline specific areas who took the time to provide each student presenter with valuable and constructive comments. The questions that were asked gave the students opportunities to further discuss the cutting-edge research that was being presented. The symposium included oral presentation from the following disciplines: Chemistry, Life & Physical Sciences (Biology, Physics, Statistics, etc. ), Engineering, and Psychology. To read the abstract of each of the presentations, please click here. The symposium concluded with a presentation on Time Management from Ms. Rosa Elena Moreno, Associate Director, SDSU Career Services. 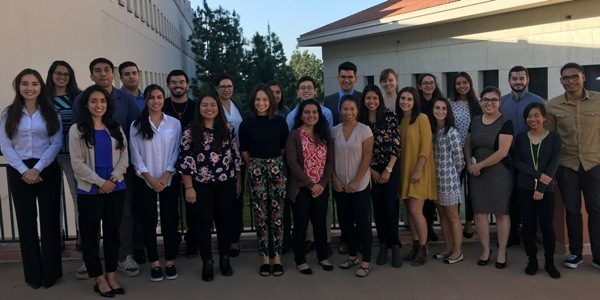 The SDSU URS is scheduled before two national conferences, the Society for the Advancement of Chicanos and Native Americans in Science (SACNAS) and the Annual Biomedical Research Conference for Minority Students (ABRCMS). Students in both programs are expected to apply to present their research at either SACNAS or ABRCMS conferences. This year between MARC and IMSD programs, eight students were invited to present their research at SACNAS, held on October 18-21 in Salt Lake, Utah, and 18 were invited to present at ABRCMS, held on November 1-4 in Phoenix, Arizona, totaling 26 presentations by SDSU. Besides networking and learning about the research being done at other universities around the country and Puerto Rico, six of our students received outstanding research awards for their poster presentations. Congratulations to all! Esteban Delgado Biochemistry Dr. Douglas Grotjahn Selective alkene isomerization and potential anticancer agents.